George Gresham was born in Virginia and his family moved north to New York City when he was young. His mother was a homecare worker, and his father was a union truck driver, which helped provide financial stability for their family. Mr. Gresham began his career in the housekeeping department at Columbia Presbyterian Hospital in Manhattan. He soon moved up to become a clerk in the radiology department and then – through the 1199 Training Fund – studied to become an MRI Technologist. Over four decades, he has held nearly every position in the union, including member delegate, organizer, vice president, executive vice president, secretary-treasurer, and was elected president in 2007. Mr. Gresham’s leadership has secured the highest standards for healthcare workers in the nation, including fair wages, affordable health benefits, dignified retirement, continuing education, child- care, safe staffing, and a real voice on the job. He has also led the union’s growth to over 450,000 members throughout Massachusetts, New York, New Jersey, Maryland, Washington, D.C., and Florida. Mr. Gresham has built a powerful voice for healthcare workers in local, state and federal government, and is a national leader on social justice. He believes strongly that the union movement must work together with coalitions to advance progressive causes, including access to quality healthcare, living wages, environmental protection, and the rights of women, people of color, immigrants, and the LGBTQ community. In 2016, Mr. Gresham was appointed Chair of the Mario Cuomo Campaign for Economic Justice, which led to the passage of the $15 minimum wage. 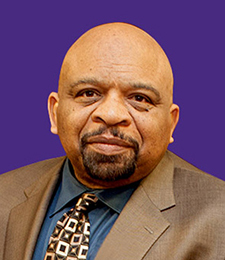 Mr. Gresham is on the boards of the NAACP; Children’s Defense Fund; A. Philip Randolph Institute; Coalition of Black Trade Unionists; Murphy Institute Labor Advisory Board; Consortium for Worker Education; Partnership for Quality Care; and SEIU, which is the largest union in the U.S. with over 2 million members. He was married to the late Sandy E. Gresham for 38 years, and he is the proud father of three children, and the proud pop-pop of one granddaughter and one grandson. Mr. Gresham lives in the Bronx, New York.